Kinnoull Hill Woodland Park to the east of Perth includes the five hills, Corsiehill, Deuchny Hill, Barn Hill, Binn Hill and Kinnoull Hill. 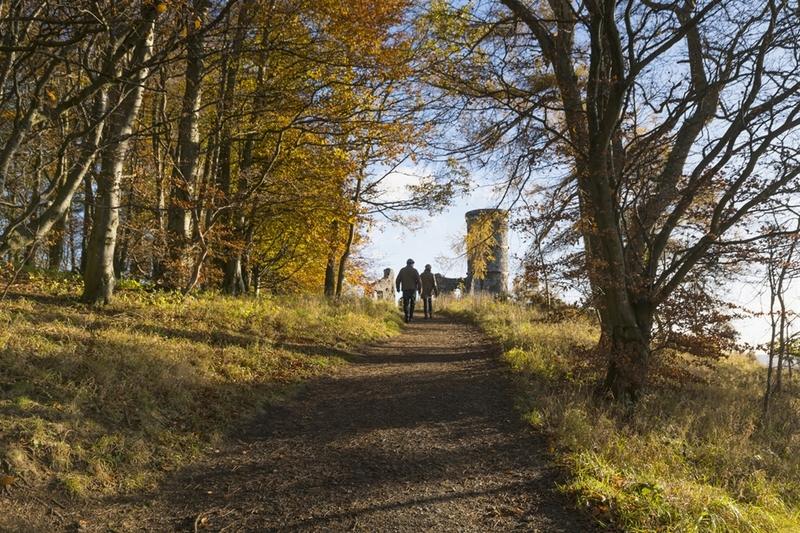 Rising sharply from the banks of the River Tay in Perth, Kinnoull Hill is the highest of the five hills and is a Site of Special Scientific Interest. This tranquil haven opened as Scotland’s first official woodland park in 1991 and includes an abundance of flora and fauna, as well as roe deer, red squirrels and excellent open viewpoints across the Perth countryside. The park also features grassy paths and waymarked nature trails through fine mixed woodland of Scots pine, larch, oak, birch and Norway spruce. Walkers of all abilities can enjoy the variety of waymarked paths across the park, and the north slopes of the hill are relatively gentle and are the main route of ascent, starting from the well used Corsie Hill car park. For those not wishing to walk, the car park itself is an excellent viewpoint affording vistas across Perth and the mighty River Tay, with views to western and northern hills beyond. 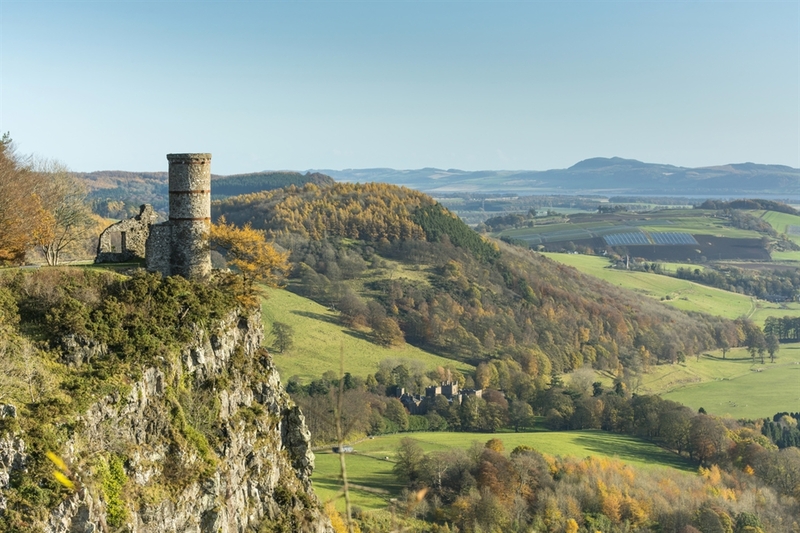 The south of Kinnoull Hill has spectacular wooded cliffs, with some sheer drops of 500 ft. A track leads along the edge of the cliffs to Kinnoull Tower, a 19th century romantic folly said to be a copy of the watchtowers found in the Rhineland in Germany. Cyclists and horse-riders are well catered for in selected areas of the park, and the Squirrel Walk is a pleasant circular stroll from Jubilee car park through beautiful broadleaved and conifer woodland. More information is available from the Perth iCentre. Getting there by railway:- Perth Rail Station is the closest. From there either walk up Bowerswell Road or Lochie Brae to the start point for the woodland walks or catch a bus. Full details from Perth Tourist Information Centre. Getting there by aeroplane:- From Edinburgh Airport follow the M90 to Perth, leaving the motorway at junction 11. Kinnoull Hill Woodland Park is accessed from the centre of Perth by turning off the Dundee Road/Gowrie Street at either Bowerswell Road or Lochie Brae. Boths road lead up the hill to the well signposted car parks close to the start of the walks. From Glasgow Airport head north on the M80/M9/A9. Kinnoull Hill Woodland Park is accessed from the centre of Perth by crossing the River Tay, then turning off the Dundee Road/Gowrie Street at either Bowerswell Road or Lochie Brae. Boths road lead up the hill to the well signposted car parks close to the start of the walks. Getting there by ferry:- From the port of Rosyth follow the M90 north to Perth, leaving the motorway at junction 11. Kinnoull Hill Woodland Park is accessed from the centre of Perth by turning off the Dundee Road/Gowrie Street at either Bowerswell Road or Lochie Brae. Boths road lead up the hill to the well signposted car parks close to the start of the walks.